This small artificial island in the Lesser Town, is separated by a mill race - Čertovka. The area of ​​the island is about 2.65 hectares and it is center of culture and entertainment in Prague, especially, when the weather is nice. Kampa has not had a name for quite some time or was called simply the Island. The name Kampa (Kampa island) has started to appear only in the second half of the 18th century and the origin is not quite clear. According to some, the word is derived from the Latin 'campus' (flat field, plain), or from old Czech 'zákampí' (shaded area). Others claim that it's connected to the name of a townsman Gangsela Camp, who owned a house here in the 17th century. There are many significant attractions in Kampa. For example, Sovovy mills from the 15th century. 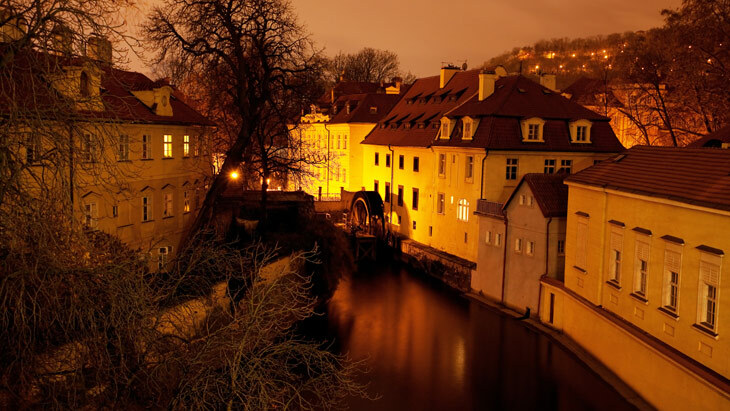 Today it is the site of Museum Kampa which houses a collection of Czech art work of the 20th century. The houses at Kampa used to be homes of many celebrities, such as the literary critic Joseph Dobrovský, the creative duo Jan Werich and Jiří Voskovec, the writer Vladimír Holan, the puppet make and illustrator Jiří Trnka, and the painter Adolf Kaspar. In the Velkopřevorský square you will find the famous Lennon Wall, on which you can leave your message to the world. Not to mention the renown 'crawling babies' by the local prominent and often controversial artist David Černý. Moreover, there is also a park on the island, which is a great place for families with children to for a weekend relaxation.